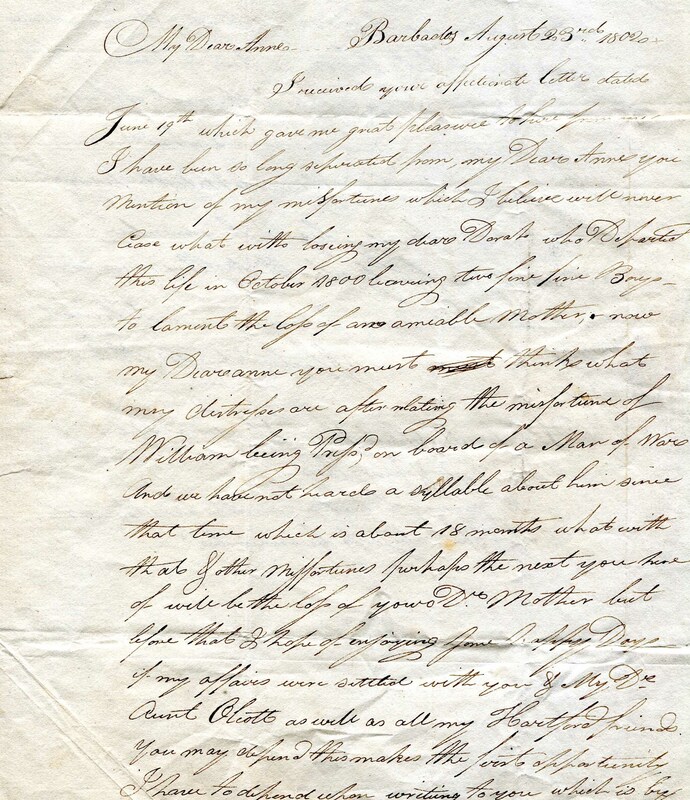 From an antiquarian dealer in Massachusetts, we have just acquired a letter dated August 23, 1802 from Barbados by former Hartford resident “Mrs. Bunce” (a prominent Hartford family) to her daughter, “My Dear Anne.” The writer laments the loss of a female friend who left two “fine, fine Boys,” and tells of her “distress” concerning “the misfortune of William being Press’d on board of a Man of War and we have not heard a syllable about him since that time which is about 18 months.” She hopes for happy days “if my affairs were settled with you & My Dear Aunt Olcott as well as all my Hartford friends.” She says this letter goes by Jack, about whom she complains greatly because of his not visiting, although “I must excuse such visits knowing the circumstances on board of a Vessel.” Her P. S. closes by saying “all the rest of the Blacks begs to be remembered.” This would be a superb subject for a history paper–who were the Bunce’s of Hartford? Did they have a plantation in Barbados? Are the sons, William and Jack, sailors of note? 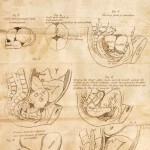 It is likely that there are family papers at the Hartford History Center, or the Connecticut Historical Society. 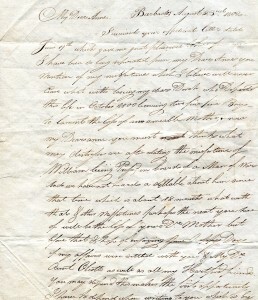 Comments Off on Letter from Barbados–just in! 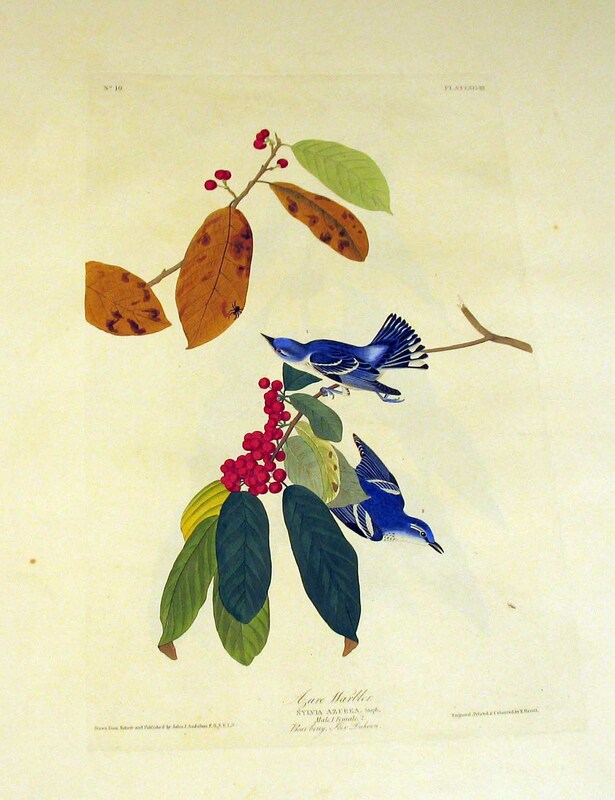 “The Blue-green Warbler has a peculiar cunning manner of leaning downwards to view a person, or while searching for an insect, and which is very different from that of any other bird, although I am unable to describe it. While thus leaning, it moves its head sideways so very slowly that the motion is hardly perceptible, unless much attention is paid to it. After this, it either starts off and flies to some distance from the observer, or darts towards the prey that had attracted its notice. While catching an insect on the wing, it produces a slight clicking sound with its bill, and in this respect approaches the Vireos. Like some of them also, it descends from the highest tops of the trees to low bushes, and eats small berries, particularly towards autumn, when insects begin to fail . . .
–J. 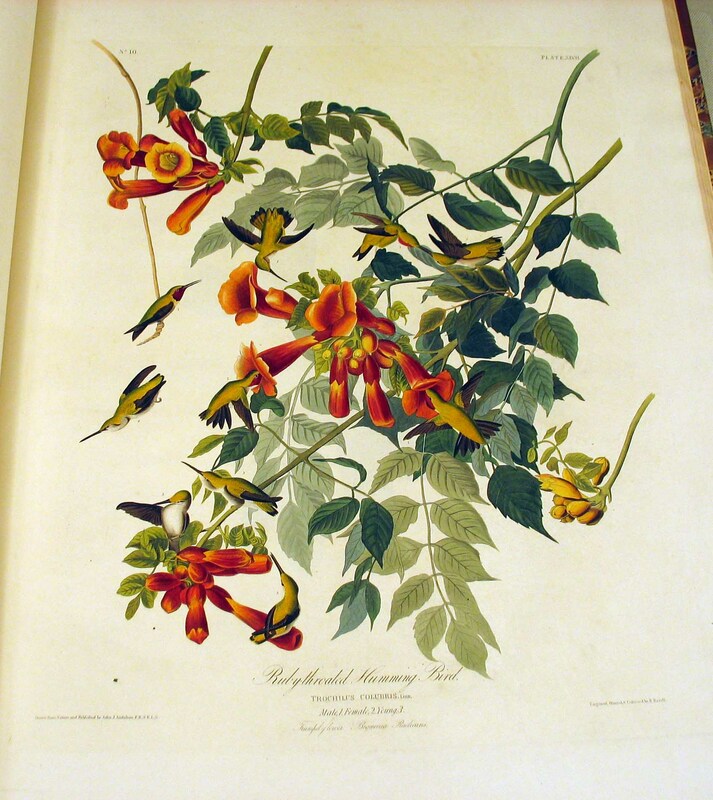 J. Audubon, Ornithological Biography, I (1831), 258-259 [excerpted]. 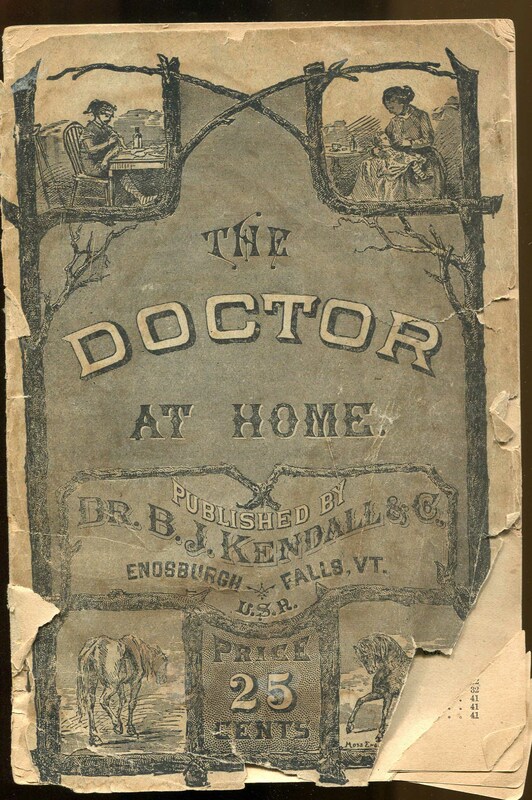 Signed by the author, American physician and founder of a patent medicine company, Dr. Samuel Sheldon Fitch (1801-1876) received his medical degree from Jefferson Medical College of Philadelphia in 1828. He began trading under the name “Dr. 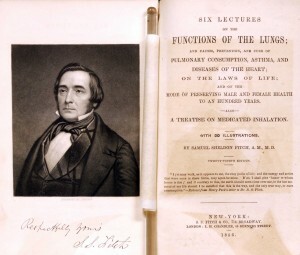 S. S. Fitch,” and about 1851 he began issuing almanacs, Dr. S.S. Fitch’s Almanac and Guide to Invalids, which promoted his patent medicines and medical devices, and prescribes health regimens and cures for consumption, asthma, heart diseases, bronchitis, head-aches, dyspepsia, ague and fever, liver complaint, diarrhoea, baldness and hair loss, and whatever else ailed you. 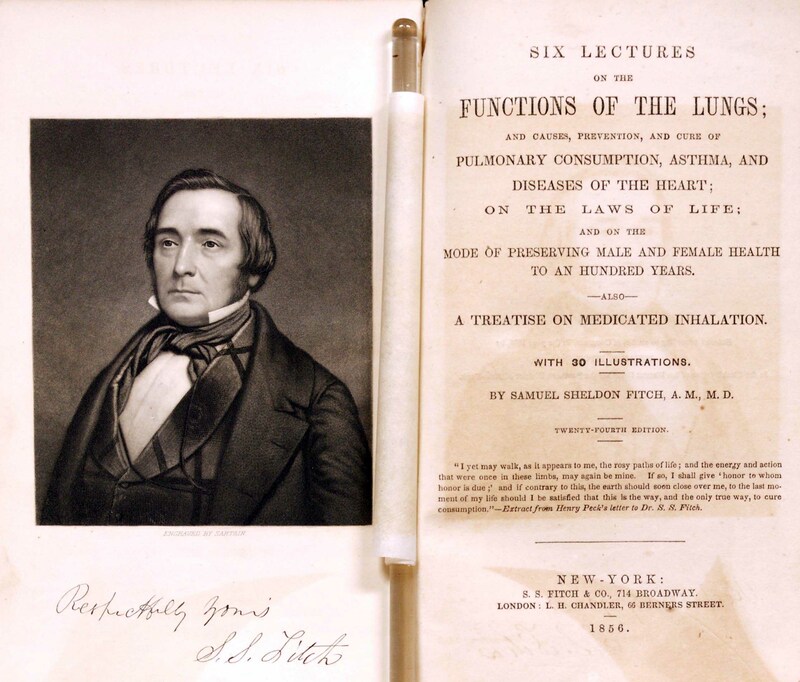 An advertisement in the 1854 Boston Herald annouced that a local doctor was the “Agency for Dr. S.S. Fitch’s Celebrated Medicines and Mechanical Remedies for cure of Consumption, Asthma, Female Diseases, etc.”. 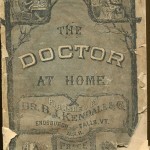 Included are testimonial letters from former patients, advice to “Invalid Ladies” & “Invalid Gentlemen,” and discussions of such topics as the function of the lungs & causes of consumption, cure of throat diseases, cold bathing, diet, spinal diseases, diseases of the heart, asthma, the effects of dancing, the use of inhaling tubes, the effect of journeys, sea voyages, and warm climate, among many others. 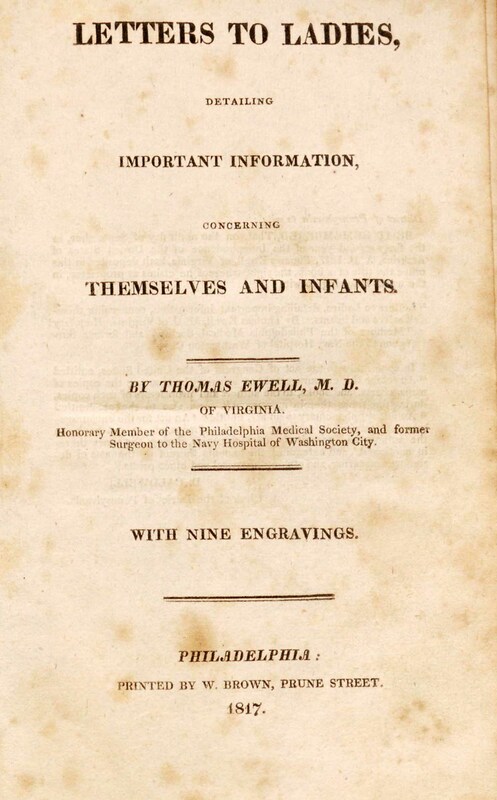 Thomas Ewell (1785-1826) was a Virginia-born physician who studied under (among others) Dr. Benjamin Rush at the University of Pennsylvania, and served as a naval surgeon in Washington from 1808-1813. He is said to have invented and used a method of making gunpowder by rolling, instead of the (more dangerous) pounding method. 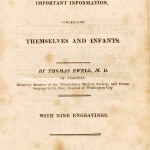 The Letters to Ladies (1817), shown here, included a project for establishing a large lying-in hospital in Washington through a nation-wide fundraising effort. 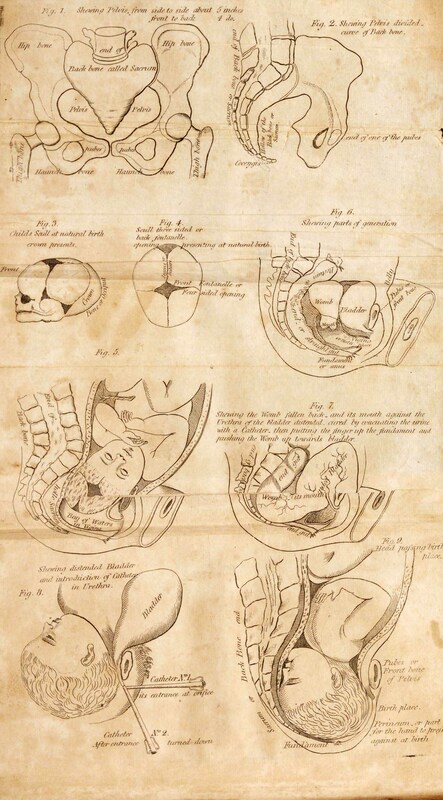 The obstetrical engraving (right) is particularly interesting. –J. J. Audubon, Ornithological Biography, I (1831), 255 [excerpted]. ” . . . No sooner has the returning sun again introduced the vernal season, and caused millions of plants to expand their leaves and blossoms to his genial beams, than the little Humming Bird is seen advancing on fairy wings, carefully visiting every opening flower-cup, and, like a curious florist, removing from each the injurious insects that otherwise would ere long cause their beauteous petals to droop and decay. Poised in the air, it is observed peeping cautiously, and with sparkling eye, into their innermost recesses, whilst the ethereal motions of its pinions, so rapid and so light, appear to fan and cool the flower, without injuring its fragile texture, and produce a delightful murmuring sound, well adapted for lulling the insects to repose. 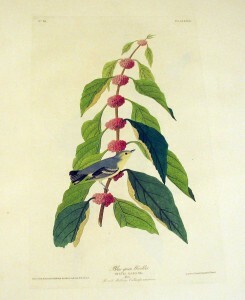 Its long delicate bill enters the cup of the flower, and the protruded, double-tubed tongue, delicately sensible, and imbued with a glutinous saliva, touches each insect in succession, and draws it from its lurking place, to be instantly swallowed . . .
–J. 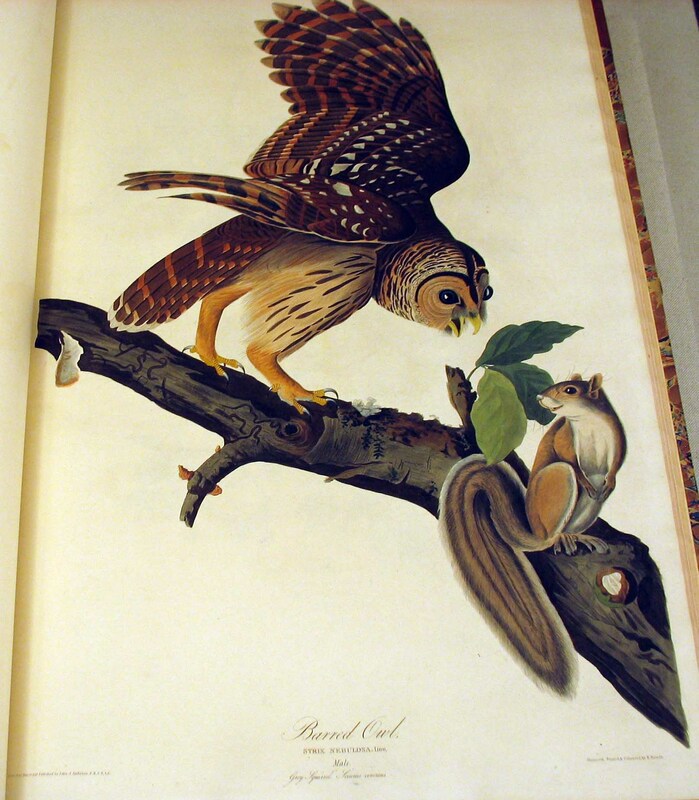 J. Audubon, Ornithological Biography, I (1831), 248-253 [excerpted]. –J. J. Audubon, Ornithological Biography, I (1831), 242 [excerpted]. You are currently browsing the The Bibliophile's Lair blog archives for September, 2012.